1. 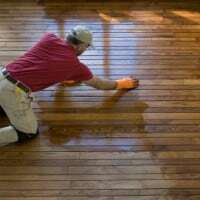 The first thing you need to to is to determine what kind of finish is on your hard wood floors SURFACE SEALED FLOOR or PENETRATING SEALED FLOOR. Rub your fingers across your wood floor. If your finger leaves a smudge mark then your floor has a wax finish which is indicative of a Penetrating wood sealed floor. Typically older wood floors are like this. A penetrating seal or oil was soaked into the floor and liquid or paste wax was applied afterwards to help seal and protect it. You need to clean this type of wood floor with care. Plain soap and water or Murphy’s Oil Soap is a good product to clean this type of wood floor. But be careful using too much water and towel dry them afterwards to blot up excess moisture. Once clean, seal these wood floors with wax. If you see no smudge when you rub your fingers across your hardwood floor, then your floor is most likely a newer SURFACE SEALED Floor. Most of these types of hardwood floors were sealed with polyurethane or a polyacrylic product. These types of hardwood floors area stain and water resistant and the easiest to care for and clean. Brooklyn’s most experienced hardwood flooring contractor!